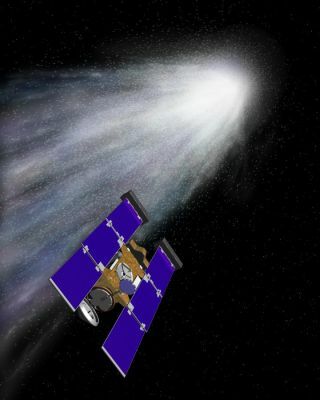 An artist's concept of the Stardust spacecraft beginning its flight through gas and dust around comet Wild 2. Scientists have found convincing evidence of liquid water inside a comet for the first time ever, according to a new study. The result, which was obtained by studying tiny granules of comet material sent back to Earth by NASA's Stardust spacecraft, should help astronomers better understand how comets form and evolve, researchers said. In particular, it shows that comets can get warm enough to melt the ice that makes up the bulk of their mass — which will likely come as a surprise to many scientists. "Current thinking suggests that it is impossible to form liquid water inside of a comet," said study co-author Dante Lauretta, of the University of Arizona, in a statement. The researchers, led by graduate student Eve Berger of the University of Arizona, analyzed tiny particles of comet Wild 2 (pronounced "Vilt 2"). The Stardust probe scooped the grains up from Wild 2's coma — the diffuse cloud of material around its nucleus — on a close flyby of the comet in 2004, then sent the samples to Earth in a capsule two years later. Comets spend most of their lives in the frigid depths of the outer solar system. So finding signs of liquid water inside the icy wanderers was unexpected. "When the ice melted on Wild 2, the resulting warm water dissolved minerals that were present at the time and precipitated the iron and copper sulfide minerals we observed in our study,” Lauretta said. “The sulfide minerals formed between 50 and 200 degrees Celsius [122 and 392 degrees Fahrenheit], much warmer than the sub-zero temperatures predicted for the interior of a comet." The discovery will be published in an upcoming issue of the journal Geochimica et Cosmochimica Acta. Closeup view of a cometary impact (center) into aerogel was inspected by scientists at a laboratory at the Johnson Space Center hours after the Stardust Sample Return Canister was delivered to the Johnson Space Center from the spacecraft's landing site in Utah. In addition to providing evidence of liquid water, the minerals put an upper limit on the temperatures Wild 2 experienced during its origin and history. For example, the researchers found one form of a copper iron sulfide mineral, called cubanite, that only exists below 210 degrees Fahrenheit (99 degrees C). "Such detailed thermal constraints will allow for detailed analysis of the role temperature played during the history of comet Wild 2," Lauretta said. Wild 2's interior could have warmed up in several different ways, researchers said. Minor collisions with other objects could have done the trick, for example, and radioactive decay of elements found throughout the comet could have as well. Comets are pieces left over from the solar system's youth — some of the stuff that didn't coalesce into the sun and planets. So learning more about comets' structure and evolution could shed light on the origins of the solar system, researchers said. The study also reinforces the fact that comets are active, changeable bodies — and that each one is likely different. "What we found makes us look at comets in a different way," Lauretta said. "We think they should be viewed as individual entities with their own unique geologic history."